Google India is running “Reunion”, a heart-warming advertising campaign addressing the separation felt by people since the India-Pakistan partition of 1947. 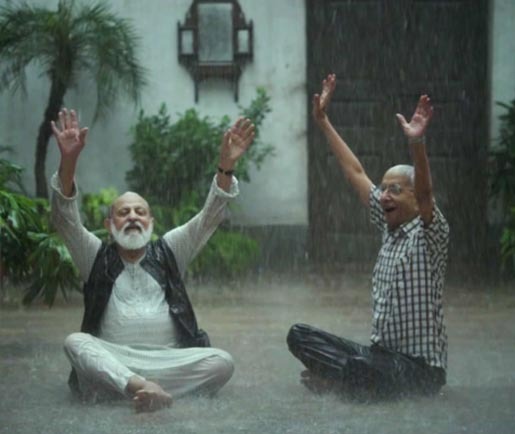 In the Reunion Anthem commercial, Suman (Auritra Ghosh), a young Delhi woman inspired by listening to her grandfather Baldev (Vishwa Mohan Badola) share his childhood memories of flying kites and stealing sweets with Yusuf (Mysore Shrinivas Sathyu) in Lahore. She uses Google’s search facilities to connect with Yusuf’s grandson Syed Shabahat Ali, to arrange an emotional reunion for the two men. A further four spots show the two men and their respective grandchildren adjusting to being in the same space. The YouTube videos have caption facilities for nine languages, including Urdu, Hindi, Tamil, Malayan and French. The India-Pakistan partition in 1947 separated many friends and families overnight. A granddaughter in India decides to surprise her grandfather on his birthday by reuniting him with his childhood friend (who is now in Pakistan) after over six decades of separation, with a little help from Google Search. Food always finds its way across languages. In “Fennel” the reunited grandfathers want to make biryani and reach a hurdle when they don’t know what an ingredient’s local name is, but with a little help from Google Search, they manage. Settle scores, instantly. In “Cricket” the India-Pakistan cricket rivalry reaches its peak during a power-cut and the grandfathers settle scores with a little help from the granddaughter and Google. Shopping for an Anarkali suit is just a move away. In “Anarkali” the reunited grandfathers decide to play match-maker with their grandkids by sending them shopping, but the grand-daughter checkmates them with a little help from Google. When fondness grows with age. In “Sugar-Free” a grandfather trying to sneak some sweets is caught red handed but is rewarded with some more; the same evening with a little help from Google. The Reunion campaign was developed at Ogilvy India, Mumbai, by national creative director Abhijit Avasthi, group creative director/copywriter Sukesh Kumar Nayak, business head Namrata Keswani, and Navin Talreja, President – Geography Head, Mumbai & Kolkata. Ogilvy copywriter Sukesh Kumar Nayak says he was pleasantly surprised when Google specified in their brief that the only thing they wanted was to see was how meaningful the search engine is in real life. “Our entire life revolves around Google, it is our instant response to something we don’t know. But we wanted to dig deeper, and make the connection between real life and Google, magical,” says Nayak. Filming was shot by director Amit Sharma via Chrome Pictures. Music was produced in Mumbai by composer Clinton Cerejo, lyricist Neelesh Jain and singer Piyush Mishra.